it's no secret that i have trouble sleeping. call it stress, call it underlying insomnia, call it a busy brain, i just don't sleep well. sharing a bed is my worst nightmare, and i require a sleep mask and ear plugs for a decent night's sleep. half the reason i insist on living in 'the suburbs' is because of the peace and quiet that comes with a leafy neighbourhood; we love noise pollution laws around se23, that's for sure. 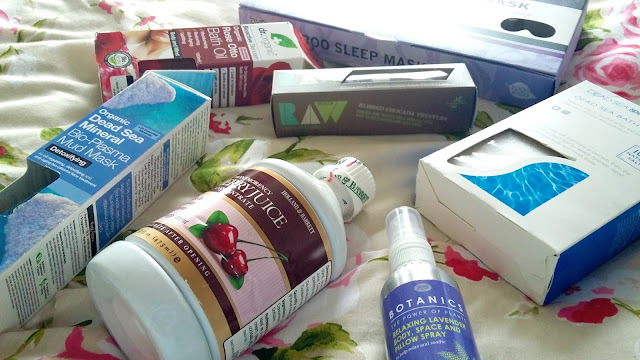 so, knowing how many home remedies i have tried over the years, i was intrigued when the good people at barker and stonehouse got in touch, asking if i'd quite like to try ~their hamper of sleep remedies. 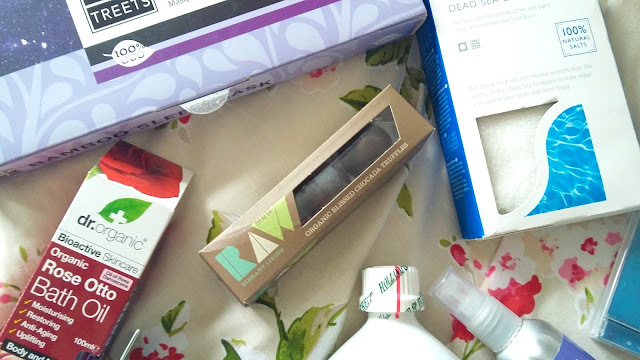 with various products ranging from a treets bambo eye mask to dr. organic's bath oils, raw cacao truffles and a relaxation cd, i wasn't sure i saw anything that i hadn't tried before. bath salts aren't an original concept for stress relief, and cherry juice helping one to sleep is such an old wives tale that i laughed to myself when i saw it in the hamper. i was surprised to not see warm milk on the list of contents, but never the less, was keen to get started with the various remedies to see if any of them actually worked. well, here's to giving things a good old-fashioned try, but most of the remedies left me as tired and sleepless as ever. i am not a fan of cherry flavoured things - something about it reminds me of cough medicine, and so there was no way i could have drank the two glasses a day that was suggested for this to work. similarly, i don't ~like taking baths. for the sake of the experiment, i had one - one - bath at home when i got home from portugal, and added the rose bath oil (which smelt wonderful, if i'm honest), but found myself so damn bored in the tub, and so uncomfortable and awkward and stressed out, that i think the whole bath thing actually wound me up more than ever. 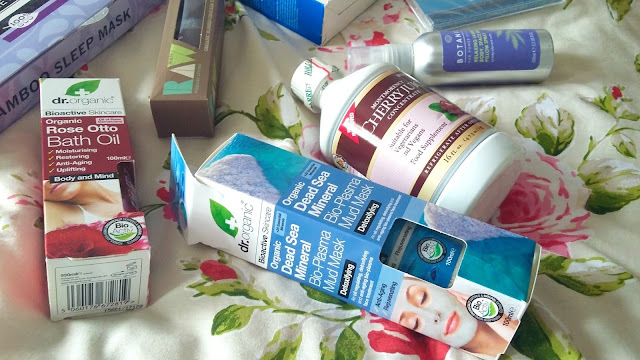 there were some bath-time extras too, like a deep-sea mud mask and sea salts and other such bath-time necessities, which i actually ended up using a few times - away from the bath. i like a mud mask; they draw all the crap out and dry them out so you don't really go spotty and oily. well, they're supposed to, i think. has there ever been a more redundant sentence? needless to say, the bath time idea also did ~not do the trick. 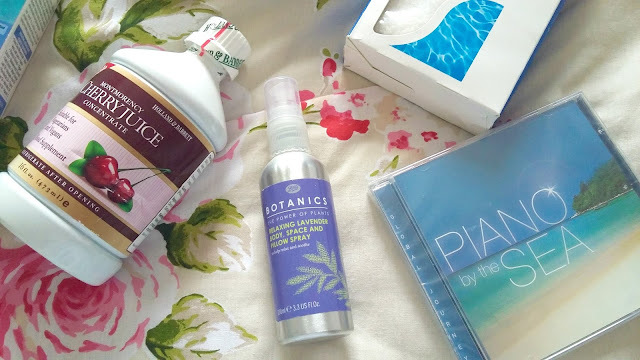 the last few things left to try included a relaxation cd (hah), and something i'd never come across, like, ever; lavender pillow spray. chloe at work told me that this was something she used a lot herself, to relax her and calm her mind before bed, and it reminded me of a special pillow i had once upon a time which was called a "passion pillow" - for what reason it was called that, i do not know, but i do know that the pillow was infused with all kinds of smells to aid sleep. i'd completely forgotten about the pillow until this lavender spray was introduced to my life, and so was keen to give it a try. and, i am pleased to report, that it ~genuinely has worked wonders! i've been using this solidly since just before i went to portugal (where we know i slept like a log anyway), and when i forget to use it, i do toss and turn until i remember it's there on my bedside table. a few little sprays over my pillows and in the air around my head, and i'm calm and relaxed in no time. long gone are the nights of relentless discomfort or not being able to shut off my brain. i mean, i'm not saying it's a miracle treatment and puts me to sleep at first sniff, but it certainly helps me get there. my sleeping disorder is caused by stress and anxiety. the lavender spray is calming in a way i've never experienced before. i've got a hand cream at work that kind of does the same thing; it's called "stress relief" and it too is infused with lavender. a couple of pumps on that on my hands and then a deep inhale from my cupped hands has me calmed down in minutes too. lavender, eh. who knew? (everyone, probably). check out barker and stonehouse's sleep guide for some other helpful tips and remedies for a successful sleep. what are your remedies? leave them below!